When DHL Express needed a durable, attractive fabric covering for its expanding operations at the Cincinnati/Northern Kentucky International Airport (CVG), Shelter-Rite Architectural Fabrics was the clear choice when choosing a supplier. 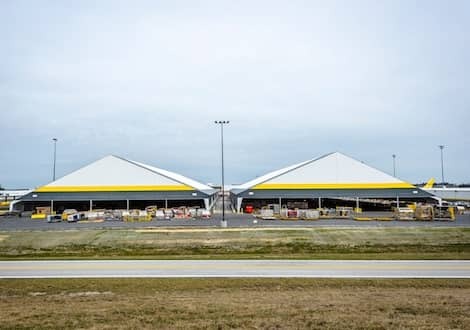 DHL was building two 205’x580’ pavilions to protect its processing-and-sorting staging area and shipping containers at the airport. They needed a tough covering that could hold up for years of daily use and withstand the challenging weather of Northern Kentucky. DHL also wanted its massive new buildings to look great and match their corporate colors. Last but not least, a U.S.-made product was preferred by the client, who cited faster turnaround times and a likelihood of excellent quality as reasons. . The builder, Legacy Building Solutions, had worked on prior jobs using Shelter-Rite products and DHL preferred the look and durability of Shelter-Rite’s architectural fabrics. Additionally, Shelter-Rite offered custom color options that could meet the specifications. 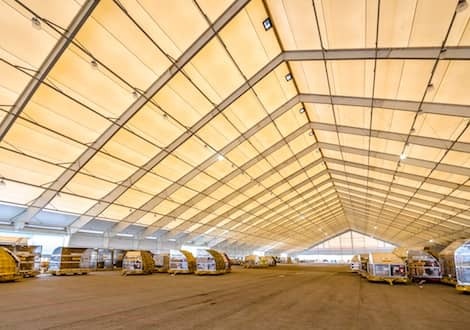 After some research, DHL & Legacy determined that Shelter-Rite’s High-Performance 8520 Architectural Fabric was tough enough to meet the local codes and airport rules, which called for flame retardant materials and capabilities of withstanding 125 mph winds and up to 20 pounds per square foot of snow. Lead Time. Seaman Corporation manufactures in the U.S. and was able to provide 20,000 yards of custom fabric in a matter of weeks. Most competitors manufacture overseas, lengthening lead times on large jobs and making custom orders more challenging. Performance. Shelter-Rite’s 8520 fabric installs tight and stays wrinkle-free throughout its lifetime. Sagging fabric can cause leaks or tears in wind. Longevity. All of Shelter-Rite’s architectural fabrics generally last at least 20 years, which is up to double the lifespan of competing materials. Aesthetics. Seaman Corporation is a U.S. manufacturer and could quickly produce custom colors that met DHL’s needs. Additionally, Shelter-Rite architectural fabrics stay attractive longer, and have superior UV performance that ensures color stability and a better top finish, allowing for much better cleanability. This was extremely important to DHL since this project’s success hinged upon its appearance and long-term performance. Support. Seaman Corporation backs its Shelter-Rite architectural fabrics every step of the way. With all of its support and service personnel in the U.S., Shelter-Rite buyers benefit from having ample technical and customer service resources who respond quickly to handle any need that may arise. Legacy Building Solutions always seeks to use high-performing products on all of its projects and uses U.S.-made materials when feasible and efficient. Given the extensive requirements of the DHL job, Shelter-Rite was an easy choice. To learn more about what makes so many demanding builders choose Shelter-Rite, see how we make it.